I hiked slowly through the fall foliage in the woods surrounding the Shuiguan Mountains, about an hour outside Beijing. Vivid orange and yellow leaves swayed on the breeze in the branches around me as I picked my way carefully along the rocky path. My footsteps were the only sound I could hear. Suddenly, there it was. Emerging through the trees was a rocky wall just in front of me. I peered up at the top of it, thirty feet above my head. Following the path as it veered off to the left and up a steep rise, I found myself standing on a crumbling, original section of the Great Wall of China. Boulders and smaller stones were scattered wherever they had come loose from the wall, resting where they were for who knows how many years. Grass and weeds sprouted up from the remaining rocks that made up the top of the wall. This part of the Wall had not been restored since the day it was constructed over a thousand years ago; it was truly a piece of ancient, undisturbed history that lay beneath my feet and undulated across the mountains in front of me. There was no one else in sight. 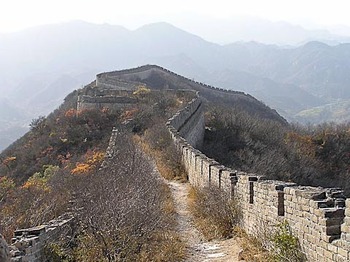 I was at a private, untouched part of the Great Wall, on the grounds of the Commune Kempinski resort. A few minutes later my small group of traveling companions caught up with me, and together we walked along the wall in silence, marveling at our incredible experience of leaving the well-worn tourist trail where hordes of people clambered up steps that were built on the wall and made of rocks and plaster younger than I am. A short while later we gathered together, still the only visitors in sight, and, as the sun began to set behind the wall, we popped open a bottle of champagne to toast the end of a two-week trip. After an astonishing journey throughout the magnificent country with East Tours, this private moment was the highlight of my travels in China. While the Great Wall is a must-see monument, most such trips stop at spots where busloads of tourists are dropped off every morning. Yet there are a few places unmarked by restoration or tourism, and surprisingly few people go there. The rare, serene experience of discovering the “wild wall” this way, unmolested by modern human hands that could never improve upon its ancient, ruinous splendor, is simply magnificent. For those who value authenticity and intimacy, Simatai-Jinshanling section of the wall is one such place; the Xiangshui Lake scenic area also has two beautiful, solitary stretches of untouched wall, as well as a restored section. To get there, instead of walking ahead to the main gate, turn right or left; both directions will lead farther into the village where original sections of the wall await discovery. There are even companies that offer horseback riding along spots of the Wild Wall, and two hotels where you can have completely private access. Red Capital Ranch is an eco-tourism resort that is set on a private estate of 50 Chinese acres; it offers 360 degree vista views of the Great Wall from each of the resort’s ten ancient, restored luxury Chinese villas that are tucked along the foot of a mountain. The Kempinski resort I visited, Commune by the Great Wall, is another such place. The Commune is a retreat for all the senses, in its private collection of contemporary architecture designed by 12 Asian architects. The grounds are comprised of forty-two villas with 190 suites and eleven Presidential Suites, four restaurants, Anantara Spa, Kid’s Club and an outdoor pool. As I bid farewell to China, I thought it was a setting that would make any movie director proud. Shelley Seale is a freelance writer and author of The Weight of Silence: Invisible Children of India. She has written for National Geographic, Globe Pequot’s Insider Travel Guidebooks, and Andrew Harper Traveler Magazine among others. Her mantra is “travel with a purpose.” She can be reached at www.shelleyseale.com. If you enjoy the articles on YourLifeIsATrip.com, please visit another great resource and one of our sponsors:Luxury Hotels The Kiwi Collection.